D.U.M.B.O. is the name of a Brooklyn neighborhood whose letters stand for Down Under the Manhattan Bridge Overpass. 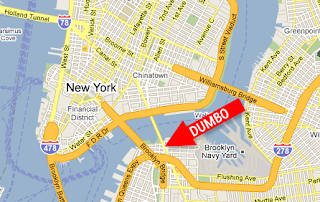 My husband used to live in D.U.M.B.O., which is great for visiting, but not the best for living because there aren't many amenities and restaurants. Anyway, since it's only one stop out of Manhattan, it's easy to pop over and visit if you're curious about Brooklyn, but don't have that much time to explore the whole borough. There are some cute spots such as Spring Design, a design store and gallery, and Pomme, a children's shop, and Zoe for men's and women's clothes. Stop and take some pictures while you're at it. 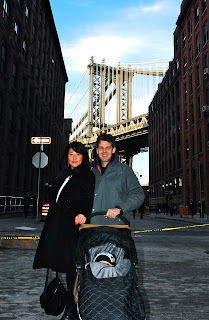 There are great views of the Manhattan Bridge from the streets of D.U.M.B.O. 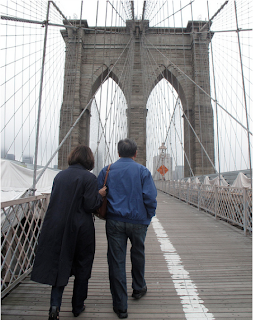 (and amazing views of the Brooklyn Bridge from the waterfront). Smile! Bubby's is a casual restaurant with basic American fare and lunch entrees that are about $15 on average. I've probably been there about 10 times over the years, mostly because D.U.M.B.O. doesn't have that many restaurant options. (My husband used to live there and that was one of his biggest complaints about living there.) Bubby's food isn't amazing, but I've also never had a bad meal there either. (They want to be a Southern style restaurant, but it's really not a place to get southern food...they don't know how to make grits.) But, I appreciate the restaurant more now because it is really stroller-friendly and family-friendly. When we were there last weekend, about half of the tables had babies at them. There aren't many restaurants that have plenty of space for strollers, but this is one of them. To get to Bubby's/D.U.M.B.O, take the F train to York Street or the A/C trains to High Street and walk 10 minutes from either station. Oh, and while you're at Bubby's, take some pictures in their old-fashioned photo booth for $3.00! 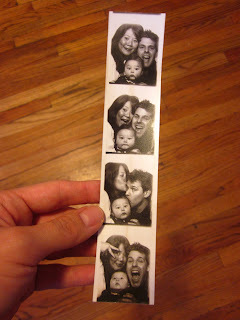 The only real printed photo I have of my baby at this point is an extra passport photo. Sad! My mother-in-law learned about this new carousel, which opened about three months ago, from the tv in the back of a cab when she came to visit us in October. I was surprised I hadn't heard about it sooner, but I was deep in newborn mode all summer and not really part of the bigger world. The beautiful carousel is in a mostly-glass housing designed by Jean Nouvel. It's cool because most carousels are pretty dark, but because of the housing, this one is really open and a part of its surroundings. Even without having a baby, I would have gone on the carousel, which was painstakingly restored from 1922. It's a great addition to the waterfront in D.U.M.B.O. 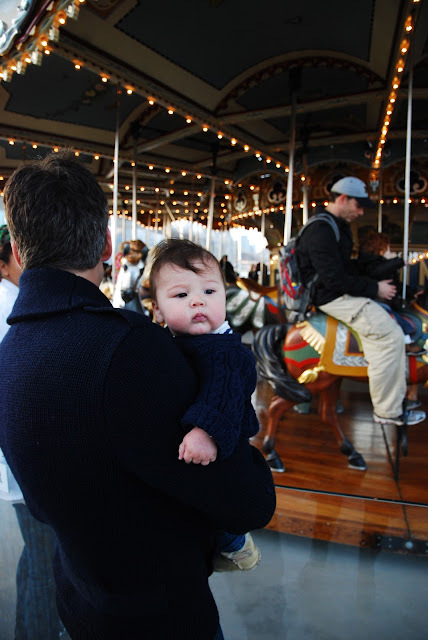 The carousel is $2.00 per person (our baby didn't need to pay, so I'm not sure at what age you have to pay for the kids) and the ride is probably about two or three minutes long. The horses on the outermost edge don't go up and down, but the others do. I haven't done this, but I plan to the next time we're in D.U.M.B.O. and the weather is nice. Here are the playgrounds in Brooklyn Bridge Park. hmmmm Now I know what are we going to do when I'm there! hahaha :) Loved the new blog, btw. Aww, thanks for being my first commenter on here! Obrigada irmã! Can't wait for you and your family to visit us here! We're going to have so much fun. Beijos!